Efforts of the U.S., Canada and Mexico to “integrate” into the North American Union continue. “Border 2020” is a program of the U.S. Environmental Protection Agency (EPA), tied to the North American Free Trade Agreement (NAFTA). The North American Development Bank (NADB) finances environmental infrastructure projects identified by the Border Environment Cooperation Commission (BECC). Both the NADB and the BECC were created by NAFTA. 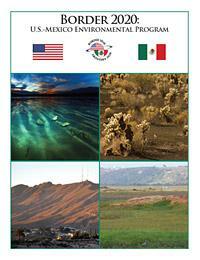 The U.S. Envi­ron­men­tal Pro­tec­tion Agency is award­ing over $8.6 mil­lion in grants to fund envi­ron­men­tal improve­ment projects along the U.S.–Mexico bor­der. The funds were announced today (Octo­ber 7, 2014) dur­ing a bor­der tour led by EPA Admin­is­tra­tor Gina McCarthy in San Diego. The EPA funds were award­ed in part­ner­ship with the North Amer­i­can Devel­op­ment Bank and the Bor­der Envi­ron­ment Coop­er­a­tion Com­mis­sion to advance com­mit­ments in the U.S.–Mexico envi­ron­men­tal col­lab­o­ra­tion known as the Bor­der 2020 Pro­gram. These grant awards are in addi­tion to sev­en envi­ron­men­tal improve­ment projects announced ear­li­er this year along the Cal­i­for­nia and Ari­zona U.S-Mexico bor­der, which lever­aged an addi­tion­al $425,500 from the recip­i­ent orga­ni­za­tions. Bor­der 2020 is a bi-nation­al col­lab­o­ra­tive effort with a mis­sion to pro­tect human health and the envi­ron­ment along the U.S.–Mexico bor­der. The North Amer­i­can Devel­op­ment Bank and the Bor­der Envi­ron­ment Coop­er­a­tion Com­mis­sion are inter­na­tion­al orga­ni­za­tions estab­lished to pre­serve, pro­tect, and finance envi­ron­men­tal infra­struc­ture projects in the U.S.–Mexico bor­der region. To date, EPA has invest­ed $597 mil­lion in bor­der envi­ron­men­tal pro­grams. EPA is pro­vid­ing $5 mil­lion to the North Amer­i­can Devel­op­ment Bank for the Bor­der Envi­ron­ment Infra­struc­ture Fund, which funds the con­struc­tion of drink­ing water and waste­water infra­struc­ture along the U.S.–Mexico bor­der. Projects along the Cal­i­for­nia, Ari­zona, New Mex­i­co, and Texas bor­der regions will receive fund­ing based on a selec­tion process con­duct­ed by EPA with assis­tance from the Bor­der Envi­ron­ment Coop­er­a­tion Com­mis­sion. The City of Holtville, Calif. will receive $3.5 mil­lion from the Bor­der Envi­ron­ment Infra­struc­ture Fund to upgrade its waste­water treat­ment plant. The $11 mil­lion project is joint­ly fund­ed with a $4 mil­lion Cal­i­for­nia Clean Water State Revolv­ing Fund grant and a $3.5 mil­lion loan. The project will reduce ammo­nia pol­lu­tion dis­charges to the Salton Sea. In part­ner­ship with Mex­i­can fed­er­al, state, and local agen­cies, the Sono­ran Insti­tute, head­quar­tered in Tuc­son, Ariz., will use $65,000 in EPA Bor­der 2020 funds to clean and restore a seg­ment of the New Riv­er in Mex­i­cali, Baja Calif. and launch com­mu­ni­ty envi­ron­men­tal edu­ca­tion and capac­i­ty build­ing efforts to pre­vent future ille­gal dump­ing and degra­da­tion in the riv­er that flows north into Cal­i­for­nia. Fun­dación Hélice, a non-prof­it envi­ron­men­tal orga­ni­za­tion, will use $52,500 in EPA Bor­der 2020 funds to address the grow­ing need to man­age dis­card­ed elec­tron­ics (e-waste) in an envi­ron­men­tal­ly pro­tec­tive man­ner. The project will build capac­i­ty to col­lect and recy­cle e-waste, using inter­na­tion­al­ly rec­og­nized best man­age­ment prac­tices, and divert these mate­ri­als from land­fills and dumps in Mex­i­cali, Baja Calif., poten­tial­ly affect­ing the New Riv­er water­shed. Sim­i­lar projects are being imple­ment­ed in the Ari­zona-Sono­ra bor­der region. The Cal­i­for­nia Depart­ment of Pub­lic Health will use $49,180 in EPA Bor­der 2020 funds to col­lect and ana­lyze impor­tant health data to deter­mine envi­ron­men­tal health dis­par­i­ties and pri­or­i­ty needs along the U.S.–Mexico bor­der. The project will include a plan of action to repli­cate this effort in oth­er parts of the bor­der area and help tar­get future envi­ron­men­tal health efforts. For more infor­ma­tion on Bor­der 2020, vis­it www.epa.gov/border2020. Dur­ing her vis­it to San Diego today, Admin­is­tra­tor McCarthy pre­sent­ed EPA Smart­Way Excel­lence Awards to freight car­ri­ers in Cal­i­for­nia and Ari­zona at the Amer­i­can Truck­ing Association’s Annu­al Man­age­ment Con­fer­ence. Admin­is­tra­tor McCarthy also met with San Diego State Uni­ver­si­ty Sage Project stu­dents and Nation­al City offi­cials work­ing on sus­tain­abil­i­ty issues in their com­mu­ni­ty. See the full list of Smart­Way Excel­lence awardees, includ­ing ship­pers, logis­tics, top-truck and mul­ti-modal car­ri­ers at http://www.epa.gov/smartway/about/sw-awards.htm.